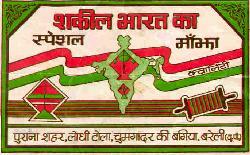 The Indian Fighter Kite, made in India and Pakistan, is called a "Patang" or "Guda". It is still the most beloved of all the fighter kites available. It is indeed one of the favorites in Johnny's collection (it's the kite he grew up flying in Bangladesh and Pakistan) and Stafford Wallace, of England, is legendary for his tricks using the basic fighter. Learning to fly fighters is a challenge, but with continued practice, you'll experience the joy of a responsive kite! In India, where these kites were invented, they are flown daily from Rooftops and during the "Kite" season at large festivals. The line used is called Manjha, a glass coated line, and each flier attempts to cut every other kite out of the sky. The last kite flying is the winner. 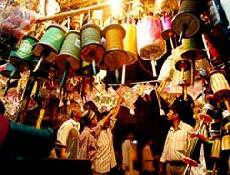 PATANG BAZI is the term used by children in India for their kite flying games. "Junior Fighter fliers in Jaipur". A "Deluxe Fighter". This is one of India's best fighters, the many pieces of paper help to prevent tearing. 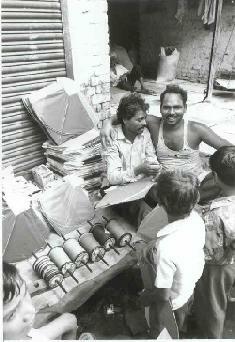 Traditionally, the Indian Fighter is made of tissue paper and bamboo; more recently, Mylar or plastic wrap with advertisement logos has been used with bamboo. These kites are fairly inexpensive and can last a long time if taken care of, small rips and tears can be quickly fixed with scotch tape. These fighters can run up to 37" (94 cm). 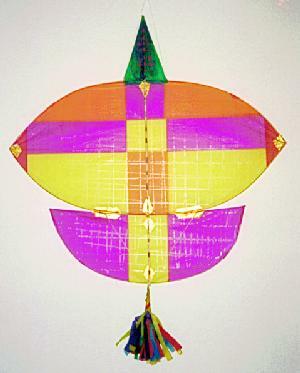 The larger Indian fighter kites which run around 48" (123 cm), are called "Chagg", and are similar to the Afghani Fighters, although the Afghani kites have more of a curve in the arch. 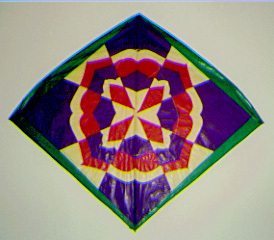 Chagg kites can have decorative designs, but those which are entirely white or black are considered to bring good luck to the flier. This large kite is considered expensive compared to the regular fighters, and is flown by the more wealthy fliers. Sometimes fliers will even attach 100R (Rupees) notes to the kite, symbolizing prestige. The Tukkal (or Tuqal), found in both India and Pakistan, is favored more in Pakistan, and can be used for nighttime flying as well. This photo shows the workmanship of the bamboo anchored to the paper with gold seals. The Tukkal has a distinctive rounded shape. It can be plain, or fancy, but the plainer versions are faster as there is less drag, or resistance, on the face of the kite. This kite's wing span is 22" (56 cm), and the spine continues through the frame to the point. The semicircular bottom section adds stability to the kite. There are larger versions of this kite, made with a wing span of up to 32" (81 cm). The Tukkal is usually flown with Manjha. 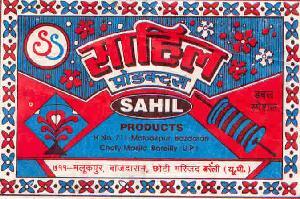 It is much heavier than the traditional paper patang's which are light and fast. Most patang fliers will not fight against the Tukkal, it's an unwritten rule, if however a match does occur, the Tukkal will almost always take the fight. Visit Jamie Al-Nasir's site to see more about Kites in Pakistan. 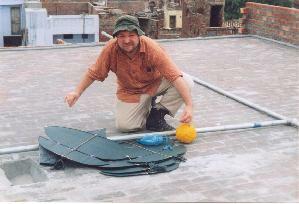 Francois up on the roof with some Tukkals. Here's Johnny with his favorite Indian reel and the kite that he made for WSIKF '93. It is made from Mylar tissue paper, a hand painted design, and bamboo spars. This kite won a first place for "Beautiful - Hand painted kite" in WSIKF's Tuesday's events. The kite was recently hanging in the Kite Gallery at the '96 AKA Convention, then in Utah for a Kite Exhibit during the month of January '97. For a unique Christmas present, I ordered a Kite Toon from David Laferriere of Lafney Studios. He designed the toon from this kite; the Art Deco Lady is on the beach flying a pink kite with Johnny's face on it -- definitely a big hit with Johnny! (1) Prevents loose line collecting on the ground around the fighter's feet. (2) Line on the ground can become a tangled mess, creating knots and preventing fast reel-ins. (3) When flying "reel-in-hand" the line is under tension and there is less chance of it becoming twisted. (4) When flying with Manjha ("cutting line"), the glass coating is not wiped off by the hands touching the line, plus there's less of a chance of finger cuts from the sharp line. Manjha line is cured with a special mix of glue and ground glass. The panda, a weave of nine threads (9 chain) of cotton line coated with Manjha is the most favorite. There are also the tees nambar, which is a six thread weave, or the dus nambar, a thicker variety. 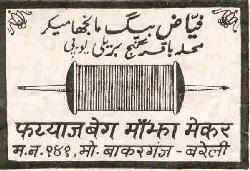 Some countries are now making Manjha on nylon line which tends to be stronger and sharper than the cotton line manjha. Visit Francois' site to see several photos of Manjha being applied to the line [Note: text is in French]. There are also more photos and two interesting newspaper articles on the India page. 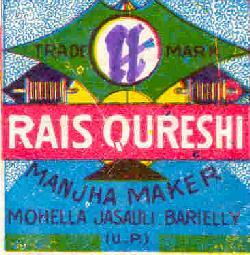 The following are examples of different Manjha Labels. Pecha is the Indian word used for a kite fight, or Tangle as they refer to it. There are two techniques used in Pechas with Indian fighters flying on Manjha (glass coated line). One is PULL, the other RELEASE. The Pull is usually favored when flying with the smaller fighters because they are lighter and more maneuverable. The kite is flown to a certain distance in the sky, between 200 to 1000 feet, and usually ahead of the other fighter kites. When ready to fight, the flier then begins pulling on his line as quickly as possible at the same time trying to cut any kite lines that are in the path of his line. Experienced fliers can cut the opponents line from either the top or bottom, and even from the side. held in India, Jan. 2000. Release cutting, letting out as much line as possible, is used more often when flying the larger fighter kites. This is where the true art of Fighting comes into the picture. Fighters are flown long distances, well over 3,000 feet. The flier needs to keep the kite stable so that it can take out more line. At this long distance, fliers may not be able to see their kites, and have to rely on the vibrations of the line to help direct them. With the larger kites, there are usually two people involved in the flying of an individual kite, and both are equally busy. While one person flies the kite, and keeps it steady, the other holds the spool and is responsible for the line, making sure that there is a sufficient flow of line for the kite. The kite that can release more line quickly, usually has the advantage over the other fighters. Listen to "National Public Radio : Fighting Kites in Southern California" Broadcast July 27, 2004 on "Day to Day". Reporter Mary Rose Abraham visits a group of fighting kite enthusiasts in Southern California to learn about the ancient combat art. Hear Johnny & Basir as they fight with manjha. during the Dasain Festival (a Nepali Kite festival). Kite shop in Accra in Uttar Pradesh. Sadu from Nepal. Here's a newly created website, "Manjha Mania" (in French and English). 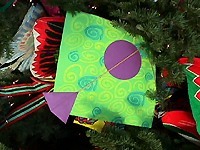 In India, January 14 celebrates the Makar Sankranti, and it also happens to be a big kite day for children of all ages! wonderful collection of photographs on Indian kites and reels. These two photos are just a sampling of the many delightful pictures provided. Browse through the Photo gallery by clicking on "Next" by the photo. Nomad Travels has held the Desert Kite Festival in Jodhpur for the last five years, between Jan. 10 - 12. 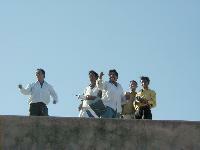 Included in the events is the ever popular Fighter Kite Competition. 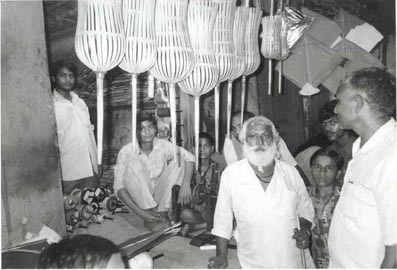 Visit the Nomad Travels of Mumbai, India site to see photos of the 1998 Indian Kite Festival in Jodhur, and the renowned kite maker Babu Khan, PatangWalla, from Bombay, in action. MILLENNIUM DESERT KITE FESTIVAL - /JODHPUR-JAIPUR - January 2000. Pictures from the Festival are on the JKA website, courtesy Masami Takakuwa. Also available is a report written by Tal Streeter titled "Single Line Kite Tangles & India's International Kite Spectacular: the Millennium Desert Kite Festival 2000"
2001 5th Desert Kite Festival Photos - See the glorious Taj Mahal as a breathtaking background for the kites. Ajay from Nomad Travels has done it again! Mikio Toki's Mumbai-Jodhpur gallery. Photos taken January 2003. Wonderful images of India, fighter kites being made, and Babu Khan. 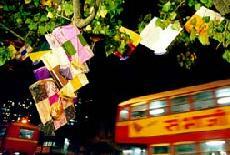 2) BASANT - 'A sky without frontiers' - the Spring Festival of Kites by Salman Saeed. March 2002 issue. Scott Hampton's last Kite drawing. Won 1st place - Eastern Kites - Beginner's Level. 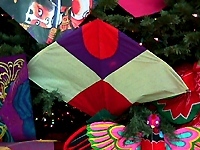 "Japanese Warrior", made in 1996.
kites were entered in the Handcrafted competition for Traditinal Eastern Kites. All three Kites are made of Tissue paper & bamboo, and the design's were handpainted. Fighters Also Make Wonderful Christmas Tree Ornaments! donated 150 Fighters to decorate a Christmas tree at the San Francisco Airport, in Dec. 1998. For more Information about India and kites, visit AppuOnline.com, a comprehensive web guide to Indians, with specific directories for websites, jobs, shopping, utilities, Indian associations, alumni, children and more.